Strangely the first two weeks of January had come as a pleasant surprise weather-wise because it was cool in Bali rather than cold. Days were warmer compared to December, with bright sunshine that almost hurt to sit in the open. Stratus clouds were often seen covering the early morning sky and then flit away with the rising sun. This week the school experienced erratic weather. On Monday nimbus clouds dominated the sky, bringing cold weather with piercing chilly winds. Showers on Monday night turned the tables to a very chilly weather. Though the sky was clear, but the chill in the air due to North Easterlies, lowered temperatures further. I can see the beautiful kites fly. Can see everyone flying kites around. Sky is covered with the kites bright. Who was there to bring you here. 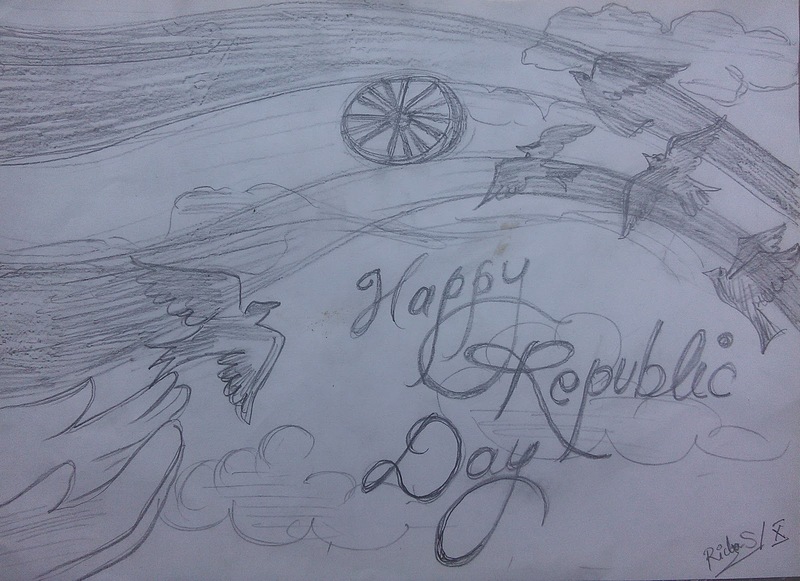 A very Happy Republic Day. 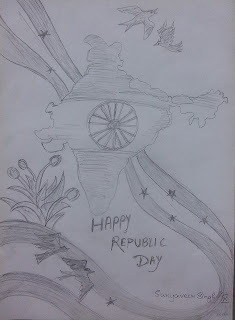 Our country celebrates Republic Day every year since 1950 with lots of love and enjoyment. This day brings warm greetings for everyone on this occasion. Since 1930 India has been celebrating 26 January as an auspicious day 26 January 1930 was marked as the first independence day of India. After India got its independence on 15th August 1947 the committee under the leadership of Dr. B.R. Ambedkar brought up the new constitution of India which replaced the government of India Act of 1935. On 26 January India became a truly sovereign state. The country finally realized the dream of Mahatma Gandhi & numerous freedom fighters had come true. So 26th January is recognized as Republic Day in the country. 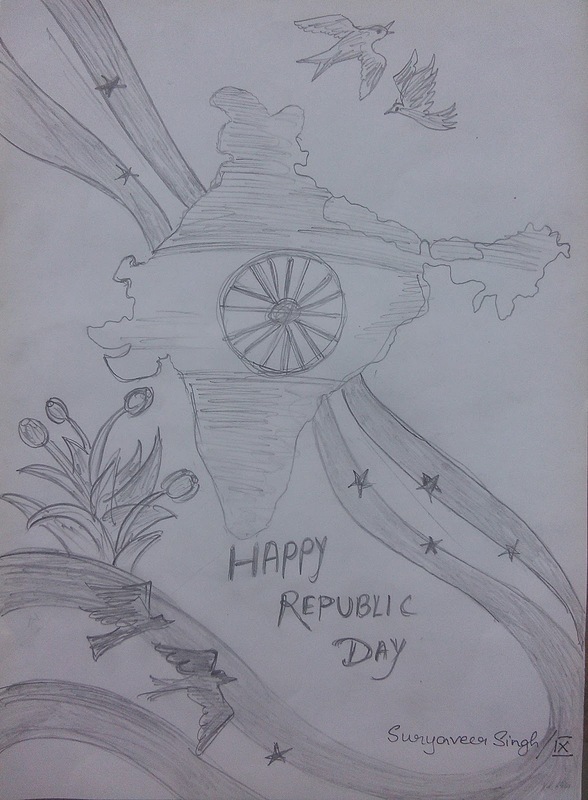 Today the Republic Day is celebrated with much enthusiasm all over the country. From today we should take an oath that we should do our best for the welfare and peace of our beloved country. In the prosperity of our country alone, lies our future. We should make India an ideal country in the world. We should dream of making India a richer and happier place to live in. No one can live in shortage. People should not be afraid of anything. All people should be educated. All people should get job of their own choices. India of my dreams should be that all are equal no rich and no one poor. Everybody should live happily. There should be no discrimination. All people should live like a family. In my ideal India no one would live in poverty and also all should live in pollution free life. It is the magic carrying man to moon. Science is the challenge of excellence. Biology provides a magical chamber. Thursday, 14th January: On the occasion of Makar Sakranti Kite flying and Kite making Activity was organized for the students of Class I to XI. Students of Class I to V made beautiful kites and displayed it on the soft boards. Students of Class VI- XI flew kites on the ground. Monday, 11th January: School reopened after a eighteen long days’ winter break. All students were happy to return to school. Bright cheerful faces could be seen catching up for the holidays and greeting each other. Class XII students were seen tensed and serious because of their Pre-Boards that started on 11th January. Friday, 15th January: A special Assembly was held on the occasion of Makar Sakranti. Mr. Dinesh Kumar/Hindi Faculty spoke to share a few facts on both scientific and religious concept of celebrating Makar Sakranti. Parade practice for 26th January took place. Republic Day parade students also went for Parade practice to the Government Senior Secondary High School, Bali. Monday, 18th January: Wild life and Environment Exam was conducted in the month of November by the Indian centre for Wildlife and Environmental Studies in South Asia Region. 117 students participated in the Exam. The School is proud of Priyank Rathod/X/DH who brought laurel to the school by winning a Gold Medal who clinched the first position in the country. Rest all the participants received certificates. Monday, 11th January: In order to facilitate staff attendance Biometric device has been installed in the school in front of Principal’s Office. The whole staff admin as well as academic register their entry and exit in the school through the machine. Tuesday, 12th January: Surana Block is completely constructed and painted. Class I A & B have been shifted from the Junior Campus back to Surana Block. Staffroom has also been shifted to Surana Block. The ground of the Junior Campus has been cleaned to get it ready for commencing Sports Day. All the events of Sports Day will be held in the Junior Campus. Now Pre-Primary Classes and Loomis Chaffee Art School is in the Junior Campus. Sports Lessons are also conducted in the Junior Campus. Friday, 15th January: To avoid students’ accidents buses parking and baording takes place inside the school from the back gate. Now buses drop and pick-up students inside school campus. During vacations buses have undergone some changes. They have fire extinguishers, water cans, first aid boxes and new seat covers. Friday, 22nd January: As fire protection is a high priority, the school has installed fire extinguishers in each block corridors. Nowadays Bus drivers and conductors are not seen sitting idly in the campus. They were seen playing football enthusiastically in the Junior Campus. It was really great fun to see them playing football on the ground. School welcomes Mrs. Harsha Suthar as new librarian and Ms. Deekshita Rao as the new nursery teacher. School bid farewell and prosperous future to Mr. Dilip Singh Inda, Mrs. Anuradha Rajpurohit and Mrs. Punita Chouhan, who have gone to pursue brighter grounds out of Bali.